Popp: According to the 2015 Global Burden of Disease Study, chronic kidney disease (CKD) is now the 12th-leading cause of death worldwide increasing by almost 32% over the last 10 years. 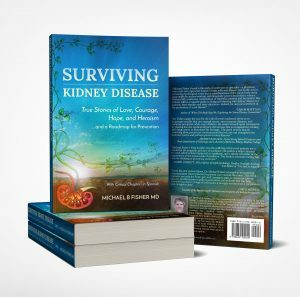 That’s why Dr. Michael Fisher authored Surviving Kidney Disease: True Stories of Love, Courage, Hope, and Heroism. Dr. Fisher is co-founder of the Santa Barbara Artificial Kidney Center and co-medical director of acute dialysis at Santa Barbara Cottage Hospital. Nice to have you with us, Dr. Fisher. I understand your life was changed by your own diagnosis. Fisher: Yes. Five years ago, I was diagnosed with lung cancer. Popp: Oh my God. How did that spur you to inform other people about kidney disease? Fisher: I was lying in bed recovering from a rather large operation, feeling a little sorry for myself. I began to think a lot about my life, as people usually do when they’re sick and there’s some uncertainty about their future. In my case, my thoughts turned to my patients. I’d been practicing medicine for about 45 years at that point, mostly nephrology—the treatment of kidney disease. I thought about some of the patients I’d seen over the years, and quite honestly, their courage and heroism inspired me. I remembered the words I would say to them when they struggled to survive and the encouragement those words gave them. If recovery is possible, I always try to give my patients hope, because hope makes a tremendous difference in survival rates. As I reviewed in my mind the drama of some of my patients’ stories, I found them amazingly inspirational. I actually decided that I would write a book to honor my patients. And feeling inspired by that goal gave me motivation to get moving again. Popp: Let’s talk about this thing called kidney disease: it’s kind of a silent killer, isn’t it? Fisher: It’s a very silent killer. And it’s a very common disease. In fact there are 35 million Americans right now with chronic renal failure. Many of them don’t even know it because our kidneys can function with as little as 30% of their capacity. So typically, the patient doesn’t experience any symptoms until the disease reaches a certain critical point; but by then, 70% of kidney function may have been lost. Popp: I’ll be darned. But we’re born with two kidneys, right? If one doesn’t hold then I’ve still got the other one to survive with. It’s not like the heart, or the liver, where I’ve only got one. Fisher: Unfortunately, most kidney disease affects both kidneys simultaneously. It is possible to traumatize a single kidney—maybe in an accident, or blow. Or you could have cancer in just one kidney, which could be removed. And yes, all we need is one good kidney to live a normal life. Which is why it’s so important for people realize that they could donate a kidney to save the life of a loved one. In my book, I tell the stories of many patients who received not just one, but some of them as many as four kidneys over time, and are alive and thriving today. It’s almost as if, teleologically, we were given two kidneys so that we could donate one. Popp: Amazing. Now you already mentioned that diabetes is one of the leading causes of kidney disease. What are other causes? Fisher: There are many, but obesity, diabetes, and hypertension are the three leading causes of CKD worldwide. 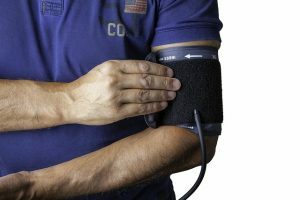 Popp: Your blood pressure affects your kidneys? Fisher: Absolutely. The kidneys actually control the blood pressure to a large extent because they regulate the body’s fluid volume. The physiology is very intricate, but hypertension from whatever cause affects the blood flow through the kidneys in a class of disease that we call nephrosclerosis, which is a silent disease also. Many people have hypertension—and nephrosclerosis—for years before it’s discovered and treated. Then there is a class of diseases we call autoimmune diseases, which occur when the immune system begins to mistake the body and normal organs for the enemy. Instead of fighting off infections, the body makes antibodies that attack healthy organs, including the kidneys. There are many, many forms of autoimmune kidney disease. Then, too, nonsteroidal anti-inflammatory drugs, NSAIDs, which are available over-the-counter, can be very toxic to the kidneys, especially as we get older. People can start taking three or four of these pain-relievers three times a day, get a little dehydrated, and if they have a little underlying kidney disease, they can actually cause kidney failure. There are also genetic causes of kidney disease. Polycystic kidney disease is perhaps the most common one, which very often, manifests itself in about the fourth or fifth decade of life. The only symptom might be that they notice their belly growing—because their kidneys are now growing cysts, which enlarge and ultimately destroy kidney function. However, the most important causes—and the most preventable—are diabetes and hypertension. Popp: I only thought of the kidneys as filtering toxins from the body. Is that true? Fisher: Yes, that’s what they do. They filter out the metabolic waste products. For example, when muscle cells break down, the breakdown product is called creatinine. The protein creatine is in the muscle, but that is metabolized to creatinine, which is a waste product that enters the bloodstream and is filtered out through the kidneys and added to the urine. That’s one very important thing the kidney does. Another important kidney function is water metabolism—maintaining the water balance in your body—as well as the acid-base balance so that, despite the acidity or alkalinity of what we eat, our cells maintain optimum pH. The kidneys also perform other amazing functions, such as producing a hormone called erythropoietin, which prevents us from developing anemia. They’re also totally responsible for converting vitamin D into the active form our bodies can use for good, strong bones. When our kidneys fail, we don’t have enough vitamin D and we start getting bone disease, or we become anemic. So the kidneys perform a lot of essential functions. Popp: And we don’t have any symptoms that they’re failing until it’s almost too late? Fisher: There may be symptoms, but people don’t recognize them for what they are. For example, the earliest symptom can be the need to get up at night to urinate more frequently. That’s simply because when you are lying in bed, the filtration rating increases, especially when there’s some kidney damage. But, as I said earlier, until the kidney function is down to less than 30% there are no symptoms whatsoever. Popp: That’s scary. Isn’t there a test we could take periodically, or something? Fisher: Absolutely. I think that’s just part of good medical care. We need to be aware of our own family histories, so that we know, for example, if anyone in our family had polycystic kidney disease. And then, to get an annual check-up and make sure your blood pressure is normal; that you aren’t excreting protein in your urine; and that you report to your doctor anything that seems a little different with your health. Popp: How can we keep our kidneys healthy? 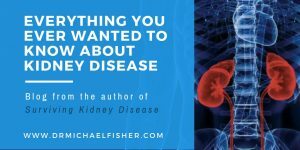 Fisher: In the final section of my book I lay out what I call “a road map for prevention,” because we absolutely can keep our kidneys healthy, and here’s the way to do it. Since diabetes and high blood pressure are two of the leading causes of kidney failure, we need to protect ourselves from the major epidemics of the 21st century. The first of these is stress. 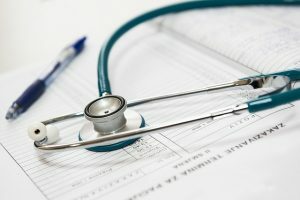 Of course, everyone has stress in their lives; but when stress becomes severe and it’s chronic, it keeps your body producing stress hormones like cortisol, which increases blood pressure, elevates blood sugar, and creates an insulin-resistance environment, which lays the groundwork for diabetes. Stress also makes people eat and drink more as a way of soothing themselves, contributing to our obesity epidemic. Unfortunately, the combination stress and obesity is causing severe insulin resistance, which means that the pancreas has to produce more and more insulin to keep up with the blood sugar. Finally, if there’s a genetic predisposition to diabetes—and I’ll just mention that all people of color have that predisposition—that’s what can develop. Diabetes causes many problems throughout the body, and one of the worst is end-stage renal failure. So one of the most important ways to prevent hypertension, obesity, diabetes, and kidney disease is to manage stress. Exercise is a great stress-reducer, which also helps guard against obesity. There are other simple and effective stress-reduction techniques, such as just learning mindful breathing. It’s interesting too because these health tips—manage your stress, don’t gain too much weight, eat right, sleep right, exercise—will guard against any disease. We really should be doing these things to protect ourselves from all kinds of health issues. Studies have shown that the people who live the longest—into their 90s and 100s—live in smaller villages where they maintain social connections, eat mostly plants—fruits, vegetables, and nuts—and are very lean. They walk; they go to market and buy fresh fruits and vegetables; they’re surrounded by friends and family members. We need to learn from them. We need to teach our public about the importance of putting the right foods into our system. These are not the processed food, but the foods that line the periphery of the supermarket, which are known to reduce the risk of many diseases. Popp: We see and hear stories about people on dialysis, which has got to be a horrendous thing to do three or four times a week, to have your blood filtered artificially. Is that necessary only when the kidney disease has advanced? Fisher: Yes, absolutely. Unfortunately, people don’t realize they have kidney disease and that it’s gradually getting worse and worse. They might say, “Oh, I’m just a little tired.” Then all of a sudden, they crash. Their filtration rate plummets to, say, 10 or 15 percent. They get deathly sick, go to the emergency room, and they have to start on dialysis. It’s far better to intervene before the crash and prepare people to take measures to slow the progress of the disease. It’s even possible to perform a kidney transplant before somebody needs dialysis, and that’s one of my great passions now: to teach about kidney transplantation to preempt dialysis, if possible, and to replace dialysis with transplants as soon as possible for as many patients as possible. Popp: How difficult is it to donate a kidney? Fisher: It’s not difficult at all. In fact, right here in Santa Barbara, we’re having a seminar in February to teach people how to talk to others about kidney donations. A gentleman by the name of Harvey Mysel is coming to lead it. He’s a two-time kidney transplant recipient whose passion in life now is to teach patients and the public about living kidney donations. In my book, I tell the stories of 12 patients who each got a donation from a family member. All of the people who donated kidneys are thriving. Thirty-five years ago, it wasn’t so clear what the outlook for kidney donors was; the field was brand new. Nevertheless, people still came forward to donate a kidney to save the life of a family member. These are our society’s true heroes. And the truth is, that kidney donors no longer have to be related to the recipient. An exchange program matches donor kidneys with the patients who are the best match. Your loved one may not get your kidney, but because of your donation, they will receive another’s kidney that is the best match for them. It’s important to remember that no physician would ever allow a person to donate a kidney unless they were in excellent health, with two, normal kidneys, no evidence of any other health issue, and emotionally and psychologically ready to donate without regret. Second, the surgery itself has become much less invasive. The kidney is removed laparoscopically, while the recipient waits, ready to receive it, in the operating room. There is no big incision to heal. Basically, the kidney just is brought down from the donor through two little pinholes in the abdomen and delivered to the recipient through a little slit in the abdomen. The incisions heal quickly and the donor is back at work, at play, and doing all the things they were accustomed to doing before their donation. Plus, they report the huge boost of happiness from the knowledge that they were able to give the gift of life. Fisher: With hope, people can overcome seemingly insurmountable odds. You described dialysis as horrendous, but I don’t look at it that way. I look at dialysis as a means to an end: the treatment that keeps you alive until a transplant becomes available. If people have hope, they can follow the very difficult restrictions on fluids and food they have to follow, and take all the pills they have to take, knowing that they’re going to feel better. And, with a little bit of luck, they’ll get a kidney transplant, and then they’ll remember what it was like to feel good again, to thrive. It’s only when people don’t really know what the possibilities are that they lose hope. So it’s up to the doctors—the nephrologists and their staff—to educate the patients and their family members, to encourage them. Hope is the most important medication we can give patients. Without hope, they give up. Popp: Can a person remain on dialysis indefinitely if a kidney is not available? Fisher: Yes, a patient can remain on dialysis indefinitely if there is no kidney available, or if they don’t qualify for some reason—typically related to other health issues. For example, a patient with severe diabetes may have so many comorbidities, such as severe cardiovascular disease, or cancer, that they may not be healthy enough to receive a transplant. Dialysis keeps many patients alive while they improve other aspects of their health in preparation for a transplant when one becomes available. However, with time and age and compounding health issues, people eventually withdraw and let the disease take its course. Nevertheless, I’ve had patients on dialysis for many, many years. Popp: I’ll be darned. I think a lot of it is that hope factor. You’ve got to keep fighting—and have a reason to keep fighting. Fisher: Yes. People have survived all kinds of horrible things. Illness is an example, and kidney failure is a catastrophic illness because when the kidneys fail, the other organ systems also go. Many patients don’t feel very well when they come into dialysis. Toxins have built up in their blood, which affects the brain, affects their energy, and their mood. This is where it’s really up to the doctors and the staff to reassure them and the family that they’re going to feel better with time. 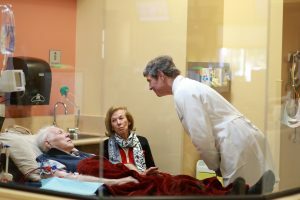 They need to explain to them their medical options—AND, and this is very important, they need to provide emotional support until the patient’s own emotional support system kicks back in. When patients get that kind of comprehensive support, they thrive. I just passed my five-year cancer-free mark and, in addition to having my physical health back, I feel very grateful to have purpose in life, to be an advocate for my patients, and to educate people across the country about chronic kidney disease and how they can avoid it.